From Left. : S&W 342, Bianchi speed strip, HKS speedloader; Colt Cobra, Kimber K6S speedloader; S&W 66, Safariland Comp M1 speedloader, Bianchi speed strip; S&W 986, full-moon clip. In the mid-1800s, Samuel Colt’s revolver was a revolutionary concept: the first practical multi-shot handgun. Revolvers from Colt and his competitors ruled both the defensive and sporting handgun scene for nearly 150 years—until law enforcement made the switch to semiautomatics in the late 1980s and the handgunning public moved the same way. However, there continues to be a strong demand for revolvers among seasoned shooters and beginners alike because a lot of people prefer the wheelgun’s simplicity and reliability. The downside, some argue, is revolvers take too long to reload. But with the right loading system and practice, a shooter can keep a wheelgun up and running in minimal time. Options for reloading your revolver include single loose rounds, half- or full-moon clips, speed strips and speedloaders. 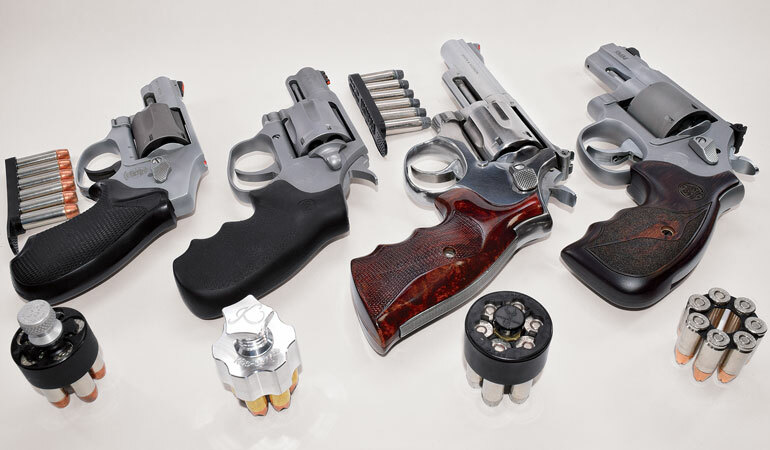 Each has its place depending on the design of the handgun and the needs of the shooter. Let’s start with moon clips, which have a long and illustrious history. Back in World War I, the U.S. military needed additional handguns to complement its inventories of Model 1911 semiautomatics. 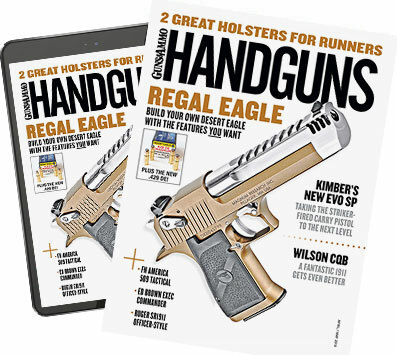 It contracted with Colt and Smith & Wesson to produce revolvers chambered to .45 ACP—a way of keeping handgun ammo supply compatible with the 1911. Moon clips evolved from the original half-moon design to today’s full-moon clips. They’re super-fast and simple to use, although a tool of some sort is required to remove empties from the clip. But there was a hurdle to overcome. Because the .45 ACP cartridge lacks a rim extending beyond the diameter of its case, empty cases could not be extracted from the cylinder by use of the ejector rod. The answer was a simple stamped piece of steel called a half-moon clip that held three rounds of ammo. By snapping the clip around the extractor groove in the cartridge base, the three rounds were firmly attached. To load, the clipped three rounds were inserted into the cylinder. By adding a second half-moon, the shooter had a full cylinder ready to go. To eject the fired casings, the shooter pushed the ejector rod rearward to clear the moon clips. Fast-forward to the early 1980s when the full-moon clip was developed for competitive shooters in bowling pin and practical shooting matches. Holding a cylinder-full six rounds of .45 ACP, the full-moon clip allowed a lightning-fast reload. Revolver master extraordinaire Jerry Miculek used this system to conquer the world of competition revolver shooting. His world record demonstration—firing 12 rounds in under three seconds with a full-moon clip reload from his Smith & Wesson Model 625—is legendary. With training and practice, the full-moon clip system is as fast and simple as it gets. The clips are inexpensive, so get a pile of them. Brass pickup is a breeze, and the only downside is the need to unclip the empty brass and reclip loaded rounds. Commercially available “de-mooners” from Dillon Precision and Speed Beez make unloading clips painless. Otherwise, careful use of a pliers will unclip the empties. Speed strips made their appearance in the early 1970s. As the name implies, it is a half-inch-wide strip—modern ones are made of flexible urethane or similar polymer—that locks onto the cartridge case rim to retain it in place. The first models were designed to hold six .38 Special or .357 Magnum rounds, but today Bianchi/Safariland and Tuff Products offer strips for other calibers. Speed strips aren’t lightning fast for reloading, but they lie flat in a pocket—making them easy and comfortable to conceal—and can be used to top off a revolver’s cylinder with one or two rounds. To load, insert one or two rounds into the cylinder at a time and apply sideways pressure to strip the rounds out of the strip’s locking slots. Two rounds at a time is the maximum you can load in this fashion, so it is the slowest of the reload systems. However, the big advantage of the speed strip is compactness: A couple of strips sit flat and unobtrusive in a belt pouch or pocket. Also, unlike moon clips or speedloaders, which I’ll get to in a second, speed strips allow the shooter to top off with just a round or two. To accomplish this, simply push on the ejector rod just enough to move live cartridges and spent cases partway out of the cylinder and then release the rod. Spent cases will stick up while live rounds drop back into the cylinder. Simply pluck the empties from the cylinder and reload the empty charge holes with fresh rounds from the strip. 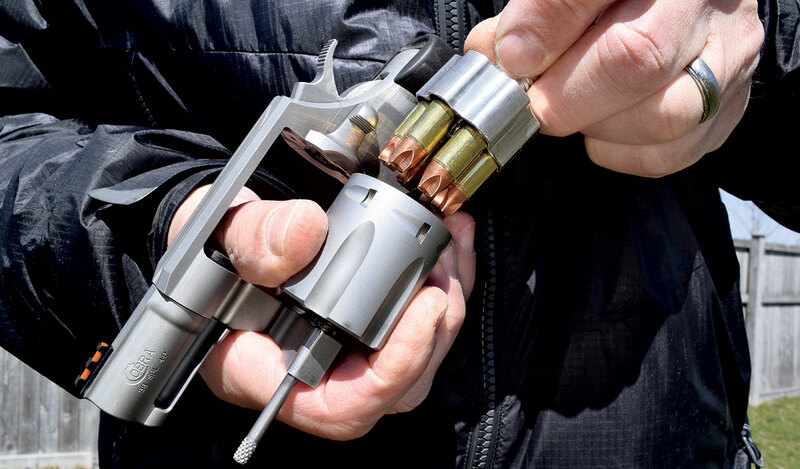 Speedloaders are the most popular devices for reloading a revolver, and they, too, have an interesting history. On June 9, 1844, at what would become known as the Battle of Walker’s Creek, 14 Texas Rangers under command of Capt. John Coffee Hays attacked nearly 200 Comanche warriors who had set out to ambush them. The Rangers were armed with Colt Paterson .36 caliber percussion single-action revolvers that were issued with extra cylinders in what could be called the first speedloaders. When a ranger shot dry, a swap of a loaded cylinder returned him to the fight. The rangers killed or wounded 50 warriors while losing only one of their own. 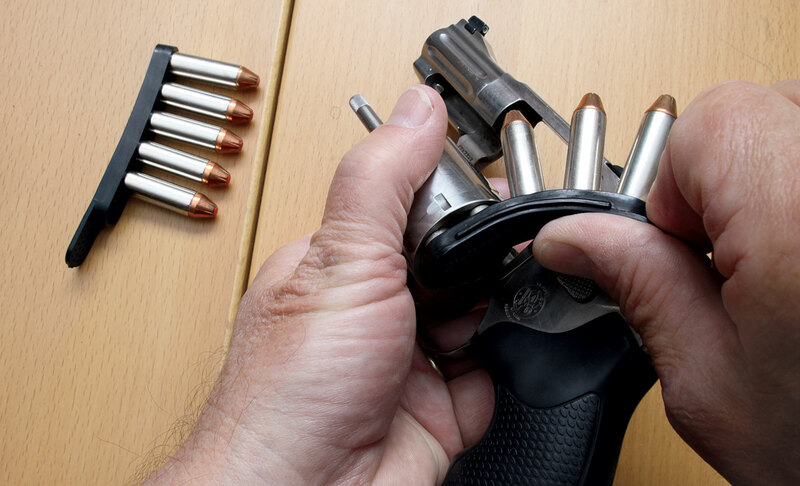 Probably the most common system is the speedloader, which holds a full complement of rounds that drop into the cylinder charge holes with either a twist of a button or by pushing in firmly with the loader. By the end of the 1800s, as top-break and side-opening cylinders were developed, devices were envisioned to allow partial or full cylinder reloads. However, it was not until the early 1970s that speedloaders holding a full cylinder of ammunition came into wide use. Law enforcement was looking to find a way to improve on the duty belt dump pouches that dropped six loose rounds into the hand. The inability to quickly reload in a gunfight on the street cost officers their lives—as happened in the Newhall, California, incident on April 6, 1970. When I started out in law enforcement, we carried revolvers, but it wasn’t until I began to shoot competition that I was exposed to to speedloaders. Manufactured by HKS and Safariland, those original six-shot loaders were a combination of plastic and metal. The designs differ. The HKS requires the shooter to insert the cartridges into the cylinder and then turn a knurled metal knob clockwise to release the captured rounds. The Safariland speedloader does not use a turning knob but instead must be pressed fully forward so that all rounds are pushed into the cylinder. As the unit moves forward, the inside center release button of the speedloader strikes the back end of the ejector rod and releases the rounds. Each type is effective, and both greatly speed up reloading time. Current models fit most double-action revolvers from the small S&W J frames and Ruger LCRs to the largest frame .44s. For competition or duty use, Safariland took its basic Comp I model, which is the most compact, and added an extended grasping button to create the Comp II and III models. This extension allows the shooter to draw the speedloader and position it for use more easily. Where speed in competition is more important than concealability or compactness, the Comp III with its extra-long handle proved second only to the full-moon clips in reload speed. A recent entry in the speedloader market is manufactured by Kimber for its K6S six-shot, snub-nosed .357 Magnum revolver. It is also a turning knob system and works size wise with my new model Colt Cobra. Featuring an extended-length release knob for easy manipulation, this all-aluminum unit is a fine piece of craftmanship. Unlike the HKS, the Kimber’s knob is turned counterclockwise to release the rounds into the cylinder. My choice in speedloaders for truly hard use is the turning-knob design of the HKS or Kimber, but where speed is the need, the Safariland rules. Speaking of hard use, some of you might question how securely speedloaders retain rounds under hard conditions. It’s a good question. In training and competition, I have fumbled a reload and dropped my speedloader more than once. I set up a drop test in which each speedloader was dropped eight times from a height of four feet to a hard tile floor. Each was dropped four times onto the nose of the rounds and four times onto the end of the release knob. No rounds were released from their speedloaders in the testing. I don’t suggest you similarly beat up your loading gear, but all the tested units from HKS, Kimber and Safariland demonstrated they are ready for the bumps and thumps of daily carry. The advantages of the speedloader are easy carry and portability, along with a fast and full loading of the cylinder. For everyday carry, the only downside is their size. Unlike a speed strip, the speedloader is more obtrusive. A pair of speedloaders in your summer shorts pocket is probably not the look you are going for, but a single speedloader pouch under your summer shirt is easily worn and concealed. In cooler weather, a couple of speedloaders in a jacket pocket is another option. See the accompanying sidebar for other speedloader accessories that can help with concealment and more. Notes: Each type of reload was drawn from the belt or pocket of the shooter’s non-gun side. Time was measured using Coach’s Eye computer app, from the last round fired through the reload to first round fired. So is there a best system? A friend who ran a well-known shooting academy had his revolver shooters divide their training and live fire time into thirds—loose rounds, speed strips and speedloaders—so each device got equal attention and students became capable with all. As part of this article, I compared various units with three different revolvers, drawing the reloads from my belt or pocket on my non-gun side. Results are shown in the accompanying table. Remember, this test was done under ideal conditions and is simply a comparison of relative times. Test them for yourself. Whatever method you choose for carrying backup ammo for your revolver, make the effort to practice with that system on a regular basis. In most self-defense scenarios, it is likely a cylinder full of ammo will meet the needs of the moment, but it makes sense to have extra ammo on hand to be sure. As the old saying goes, better to have it and not need it than to need it and not have it. One solution for carrying a speedloader concealed is the Second Six speedloader holder from DeSantis. It is a leather speedloader pouch that wraps around the belt and snaps in place. The rounds in the speedloader straddle either side of the top lip of the belt. A security flap covers the unit and incorporates a large center hole for the protruding knob if you are using HKS or Kimber speedloaders. (This unit also works quite well for carrying the seven-shot moon clips for the Smith & Wesson 986.) It’s made to fit all sizes of loaders up to the big S&W N frames. Safariland’s Speed Loader Holder (shown) is a skeletonized spring steel design that clips over the belt and holds the speedloader in place via friction fit. While I have tested this model for concealed carry, I feel it is best used for competition where speed is more important than retention. Safariland also sells a speedloader loading block. 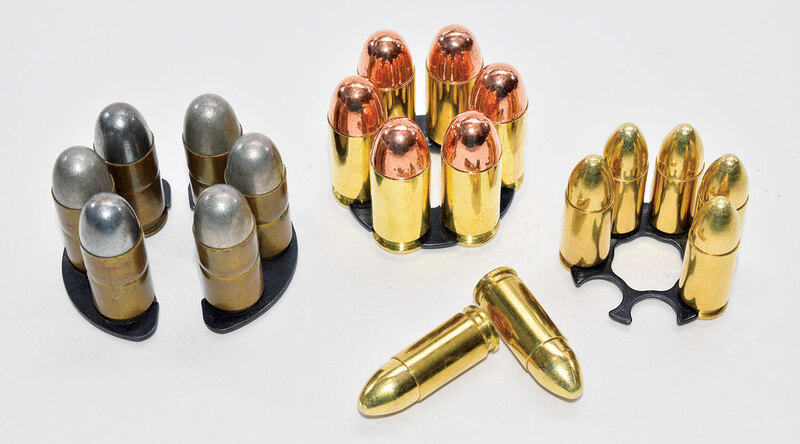 The molded unit is designed to hold six .38 Special rounds of ammo, bullet nose down, in a circular configuration the size of the speedloader (two variations are available). Drop the empty speedloader onto the base of the rounds and lock the ammo in place and you are good to go. In all, there are 14 ammo circles for loading and/or transporting your speedloaders.